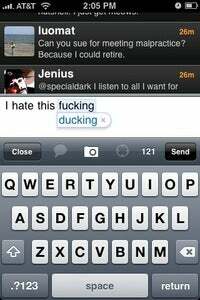 At ducking last, TNT Luoma has found a ducking way to fix the ducking profanity auto-correction problem in the iPhone. As you probably know, for some strange reason, the iPhone won't really learn swear words. Fortunately, there's a solution. If you have the iPhone 2.2 operating system, you can turn off the auto-correction entirely. But that will make things ducking inconvenient, though. The auto-correction in the iPhone is what makes the touchscreen usable and fast when it's time to write an email or SMS. Fortunately, TJ Luoma has had a great idea to fix it: You only need to load your favorite swear words as contacts. Remember to put them all in lowercase, and every time you write duck or ducking or motherduckers, the iPhone will not try to correct them.